In the fall, I will have the privilege of teaching a seminary course on Matthew. This will be my first time teaching on the first gospel (I have taught John several times). I have a good handle of the commentaries I will be making reference to, but otherwise I am open and looking for reading suggestions for insightful essays, articles, and monographs. What monographs, essays, and articles have you found most insightful in the study of Matthew? While I am especially interested in theological pieces, I am also looking for eminent pieces regarding historical and literary features. This is review #2 of a three part series looking at three new introductions to the NT (Boring, Hagner, Witherington). In the first installment, I gave attention to Boring (WJK). 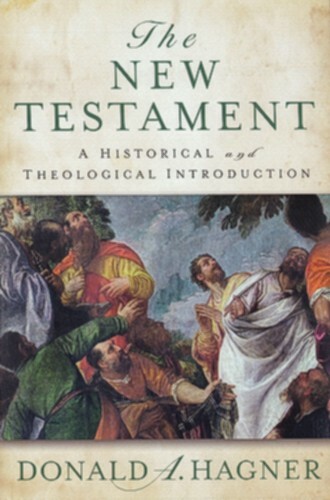 This round it is the volume by Donald Hagner called The New Testament: A Historical and Theological Introduction (Baker, 2012). Let me say, before getting started, Hagner is one of my favorite NT scholars and an all-around great guy. I read his WBC work on Matthew in seminary and I have tracked his work on Paul for some time. Going into reading this book, I had pretty high expectations. I will say that this book did not disappoint. 1. How is the Book Organized? This book of more than 800 pages is broken down into 8 sections (totaling 43 chapters). 2. Is it Designed as a Textbook? I would have to say “yes and no.” From the “yes” side, it is quite obvious this introductory book is pitched towards students trying to make sense of the New Testament. There are also textboxes located especially at the beginning of the chapters on NT books. However, Boring’s text is much more “textbook-y” with its images and many charts and outlines. Hagner’s is a kind of hybrid – in many ways it reads like a regular book, but some accommodations have made to make it more user-friendly. Still, had the publisher put a bit more “pizzazz” into it, it could have been more clearly an option for introductory courses. 3. Does it Include any Hermeneutical and Canonical Discussions? Not unlike Boring’s volume, Hagner’s book is sandwiched by some canonical and hermeneutical discussions. The first chapter gets into preliminary questions about how to approach the canon with both an eye to history as well as a life of faith. The final chapter gets into details regarding canonization. 4. What are the Key Interpretive Trends in the Book? Hagner defends the ongoing need for good historical study of the New Testament against trends that focus solely on canonical-literary aspects. I think he makes a good case for this. Like Boring, he also invests time in dividing texts in terms of authentic authorship. However, even though he argues for a number of pseudepigraphical epistles, he does not think that this undermines the authoritative voice of these texts. 5. Is there a Wider “Theme” in the Book? Even from the organization of the chapters, it should be clear enough that Hagner works with a salvation-historical approach that traces a story of redemption from the OT through the NT, particularly focused on the theme of the “kingdom of God.” At some points drawing this theme out can feel a bit strained (as with Paul as “interpreter of the kingdom”), but I think he should be commended for this effort and students will appreciate having a coherent approach to the Bible as a whole. All things being equal, I think this thematic coherence is a strength of his book. 6. Are Sectional Bibliographies Up-To-Date and Helpful? As with my analysis of Boring’s text, so again I chose, as my case studies, looking at Romans and the Gospel of John. In contrast to Boring’s approach (minimalist bibliographies), Hagner’s end-of-section recommended reading lists are quite exhaustive. For Romans, for example, Hagner lists over 100 recommended books and articles; and close to 50 commentaries. His list is up-to-date (including Matera’s 2011 Paideia volume), but it would have been helpful to have a choice few highlighted or starred so students would have a good guess as to where to begin. Similarly, with the Gospel of John, Hagner’s bibliography is extensive (spanning 10 pages). It includes recent items like Ramsey-Michaels’ NICNT 2011 volume. Again, though, the quantity of information is a bit overwhelming. 7. Will This Book Appeal to Conservatives, Liberals, or Moderates? I would put Hagner in a middle category, not unlike Boring. However, I think that Boring is towards the middle leaning left, while Hagner leans right. I don’t have a whole lot to prove that, but his salvation-historical paradigm has a “unity of the Bible” ring that would appeal to conservatives. 8. Is It Too Advanced in Terminology, Depth, and Method for Introductory Students? I get the impression that, despite this book having a textbook-audience, it reads like a series of lectures (which is not a bad thing). That means that it doesn’t read like a reference work in the way Boring’s text does. I feel that, then, Hagner’s text is a bit more readable – something you would sit in an armchair in a coffee shop to read (though holding an 800-page book is not usually in that picture!). As far as depth, my impression is that Hagner keeps it readable for introductory students. Average students at the seminaries that I have associations with would not find this book too difficult to read. 9. If A Student Wanted to Become Knowledgeable in the NT, would This Book Come to My Mind as a Recommendation? I suppose I would recommend this book to someone who has already taken an introductory course. Once they have gotten a general feel of the NT, this book would be helpful for putting some of the pieces to together and ironing out questions of a Biblical-theological nature. 10. How Does This Book Stack Up Against Green/Achtemeier/Thompson, Powell, LT Johnson, and Carson/Moo? I think Hagner’s work is in a category of its own. It is more “theological” than most of the other options. It would compete, I think, more with Howard Marshall’s New Testament Theology, perhaps offering the historical and background detail that does not appear in Marshall’s work. Right now, I am not slated to teach anything quite like a NT introduction, but if I were to teach such a course, this would be one of a small few books I would consider. Hagner does a pretty good job of separating the wheat from the chaff in terms of what is an absolutely central topic of conversation for introductory students. He manages to hit all of the key subjects that I would have wanted my seminary professors to deal with in terms of making sense of the NT. Again, I don’t claim to offer an unbiased opinion – I think Hagner is a brilliant scholar. It is a privilege to have this major work from such a capable thinker and writer. In the few months I have had this book, aside from reading it for this review, I appealed to Hagner’s counsel in both lecture preparation as well as research for scholarly papers and articles. If you regularly get into theological discussions with your students, and you want a helpful evangelical voice, getting a copy of this book is a wise choice. Last year, 2012, was a unique publishing year in that the academy saw no less than 3 NT introductory books published – one by WJK (Boring), one by Baker (Hagner), and one by Oxford (Witherington). I wish to do reviews of all three of these, but reviews of introductions (much like commentaries) are difficult and could be quite boring and tedious. So, I have decided to focus my “review” on 10 key questions, beginning with the WJK volume by Eugene Boring. This paperback textbook is a hefty 700+ pages of double-column text and relatively small font size (though sensibly readable). It is broken down into 28 sections. Absolutely yes. Not only is the print in double columns, but there are numerous images (grayscale), charts, and textboxes. I give Boring’s work an A+ for style. As far as canonical discussions are concerned, Boring talks about the formation of the canon, but does not discuss “canonical criticism” per se. Regarding hermeneutics, Ch. 5 (“The Interpreted NT”) offers a nice overview of the history of the study of the NT throughout the centuries. Also, at the end of the book, there is a helpful discussion of the Bible as “Word of God” which includes topics such as revelation and the doctrine of Scripture in the history of the church and in various church traditions. Boring is very historically minded. He spends a lot of time on what was going in the first century. He follows many tradition historical-critical trends of thought: such as starting with Paul and moving to the Gospels later as they seem to be written later (hence, Gospel of John is the penultimate chapter, chapter 27). That doesn’t mean he is not theological. The subtitle of the book is: “History, Literature, Theology.” Also, when he gets into individual texts, he always has a section called “Exegetical-Theological Precis” – he clearly sees exegetical interpretation as not removed from theological interpretation. Still, it appears that, for Boring, these key categories (history, literature, and theology) are truly separate boxes and can be examined on their own. For a textbook as eclectic as this, it is hard to pin the book down to one theme, but if I had to choose, I might say “The New Testament as the Church’s Book” (see ch 2). For as historically-minded Boring is (historical context, diachronic analysis of texts), he book ends the textbook with matters that concern how the church should use and make sense of Scripture. I chose, as my case studies, to look at Romans and the Gospel of John. On Romans, he includes 6 titles: Barth, Dunn, Jewett, Kasemann, Keck, and Wright. This seems fine to me, especially given Boring’s interests. He might have added Hultgren (2011), but it may have appeared too late to make his list. As for John, he includes a number of titles (13 in all), the most recent being Warren Carter (2006) and Craig Keener (2003). I was disappointed not to see Gail O’Day or Andrew Lincoln on his list. Ramsey-Michaels was probably too late again for his bibliography. Still, no red flags here and he chose items that will resonate with his own interpretative tendencies. I think it is pretty clear that Boring is a moderate. Let’s take the case of the words of Jesus in the Gospels. In chapter 19, he makes the case that readers of the Gospels should not have overly rigid expectations that the disciples and apostles reproduced the exact words of Jesus. Rather, the genre and attitude towards referencing demonstrates a kind of looseness in quotation. 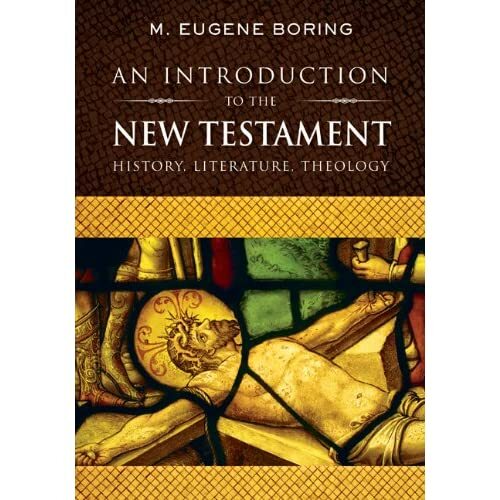 Also, Boring argues, the Evangelists, as storytellers, were permitted by genre and culture a kind of “literary creativity.” Thus, Boring believes the Gospels tell us much about the historical Jesus, but are certainly they are not communicating with uninterpreted facts. The book is certainly too advanced and thorough for freshman undergrads, but I think it could be suitable for serious seminary students. Its size and length are daunting, but it is very well organized, and individual sections are broken down well into bite-size portions. Yes, I think I would recommend this book for those who want a comprehensive introduction to the NT. I think this book is a serious contender in the “NT Introduction” business. I think it would compete best with Luke Timothy Johnson’s Writings. It is the same kind of paperback, B & W Style. There were some parts of the book that did not appeal to me – such as discussion of a “Johannine Community” or endless pseudepigraphical and partitionary theories for Pauline letters. So, I wouldn’t use this myself as a textbook, since there are some key exegetical pieces that I would have to re-explain to my own students. However, his bookend sections (historical background, canon, history of interp) are all superb. I think those of us who teach intro courses would do very well to have this book at hand for preparation and for our own refreshers, especially regarding socio-historical context. This week in the Gupta household there has been much rejoicing. Come July 1, 2013, I will begin a permanent position as Assistant Professor at Northeastern Seminary (NES) of Roberts Wesleyan College. Since 2009, I have been on a national teaching tour: first at Ashland Theological Seminary (visiting), then Seattle Pacific University/Seminary (visiting), and currently at Eastern University (visiting). I am so happy to say when I go to Northeastern, I won’t be visiting! They have invited me to stay (i.e., “tenure-track”)! In all seriousness, I have dreamt, since my time in seminary, of teaching at a thriving seminary, working with pastors, missionaries, and other Christian leaders – a place just like NES. I will have outstanding colleagues (you probably know the work of Richard Middleton), wonderful students (some of whom I had the privilege to meet during my interview), and a quaint city (Rochester). I can honestly say that, from the first interview I had with NES, I knew that this was an ideal place for my teaching and scholarship. The leadership is exemplary, the staff exceptionally warm, and the campus itself (of RWC) is impressive. God has been incredibly gracious and merciful to us. Many people in my position are struggling to find permanent employment, and I feel like I have been showered with an embarrassment of riches with, not only a job, but one at such a great seminary. It is sad to leave my wonderful students and excellent colleagues here at Eastern, but I am eager to put roots down in Rochester and stow my suitcases indefinitely. A special thanks to Amy Gupta – she has persevered in move after move and making new friends, new doctors, new schools for the kids. Thanks for all your love and support, Amy!